If, like me, you were stung by the disappearance of major characters in the course of Season 3 of Downton Abbey, perhaps will find some grim enjoyment in the following. After the dramatic cast attrition that began in Season 3, picked up speed in Seasons 4 and 5 with a swallowed champagne cork (Mosley) and bad oysters (three Crawleys, Mrs. Patmore, and a couple of unnamed kitchen staff), and reached a horrific crescendo in the final episode of season 6—the unforgettable crashing chandelier (“the body count of Granthams and Crawleys in the drawing room at that moment brought to mind the corpse-strewn stage in the final moments of ‘Hamlet'”—The Guardian), this new season begins on a quieter note. Carsons continues to be exasperated by the whirring gears (all right, the turning gears) of a new can opener. 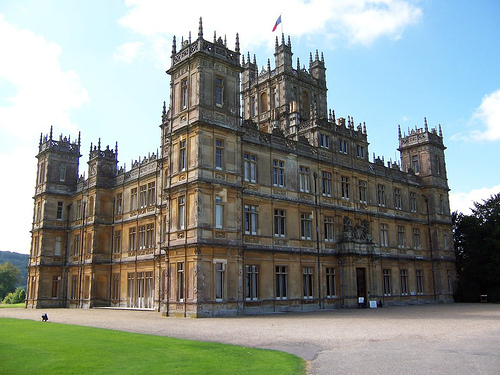 Lady Mary and Branson have now moved to separate wings of Downton, meeting only in the evening to claim their children from the nursery, where of late young Lady Sybil is playing soldier with her cousin, young Matthew “Ponsy” Crawley. While the children use building blocks and a toy pop-gun to re-enact the Easter Uprising, a different, far more sinister mischief is playing out in town: someone is clipping off all the rose blooms in local gardens. Believing that these matters should be dealt with a firm hand, Lady Grantham proposes flogging the commoners. If you are among the viewers who have found the empty rooms and Beckett-like silences of this season a tad dispiriting, you will rejoice or at least take heart at the arrival of previously unmentioned Crawley cousins from across the pond, even if they are played by Britney Spears and Adam Sandler. On a misty morning, the town constable catches the elusive rose thief in action. A magnificent 12-point buck makes a quick breakfast of three magnificent blooms of Variegata di Bologna before bolting over a hedge-row. Still adamant about obtaining a confession, Lady Grantham suggests flogging the local fauna as well as any itinerant Catholics. Branson survives his drinking binge, and good news for the coffers of Downton arrives in the form of a job offer for the flush-faced heir as a local sales representative for Jameson’s. Lady Mary’s absence from the cast is hardly noticeable as her letters continue to arrive from India. Meanwhile, Carsons summons the courage to watch one of the new talking pictures that have created such a stir in town, though he ends up exasperating other audience members when he berates the onscreen kitchen staff for their slovenly service. The rumors bruited in Entertainment Weekly are, alas, true. The actor hired to wear front half of the deer costume in the role of the rose thief seems to have optioned out of his contract at the end of Season 7, and now we’re getting only glimpses of the back half of the animal—which explains the sometimes puzzling placements of garden walls, delivery trucks, and that restless tinker with the sandwich board. Since no gentleman would ever shoot a prize stag from behind, this four-legged marauder seems destined to live on at least until the next round of negotiations with the actors’ union. Granted that of all the Granthams and Crawleys, we’ve seen only Branson for the past two episodes, and the actors playing servants seem to change abruptly every few scenes. But the intrigue of the show continues as Branson struggles to meet his sales quota with Jameson’s while unraveling the mysteries posed both by Mary’s letters and some cryptic postcards from New York, which as one astute viewer has noted appeared prominently two seasons ago on Antiques Roadshow. Despite its longeurs, the season reaches a highly satisfying conclusion when Carsons beats the Adam Sandler character to death with a poker. A rousing finish to this epic tale. This entry was posted in humor, television and tagged Downton Abbey, humor on April 24, 2013 by John.